トップ > JAMA > Duration of Antibiotic Treatment in Community-Acquired Pneumonia: A Multicenter Randomized Clinical Trial. Duration of Antibiotic Treatment in Community-Acquired Pneumonia: A Multicenter Randomized Clinical Trial. Question How long should antibiotic treatment last for patients with community-acquired pneumonia? Findings In this randomized clinical trial that included 312 patients, the clinical success rate was 50.4% in controls and 59.7% in the intervention group at day 10 and 92.6% in controls and 94.4% in the intervention group at day 30 without significant differences. The community-acquired pneumonia symptom questionnaire scores at days 5 and 10 were similar between the groups. Meaning Basing antibiotic treatment duration on clinical stability criteria leads to a significant reduction in treatment duration without increasing the rate of adverse outcomes. 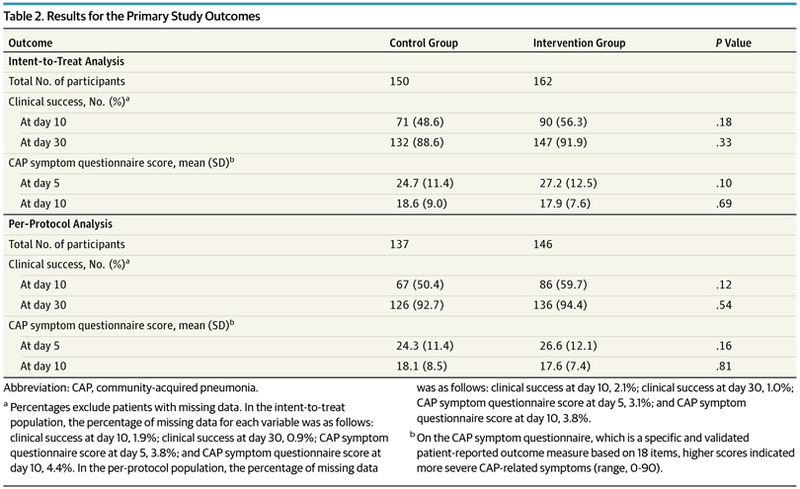 The optimal duration of antibiotic treatment for community-acquired pneumonia (CAP) has not been well established. To validate Infectious Diseases Society of America/American Thoracic Society guidelines for duration of antibiotic treatmentin hospitalized patients with CAP. This study was a multicenter, noninferiority randomized clinical trial performed at 4 teaching hospitals in Spain from January 1, 2012, through August 31, 2013. A total of 312 hospitalized patients diagnosed as having CAP were studied. Data analysis was performed from January 1, 2014, through February 28, 2015. Patients were randomized at day 5 to an intervention or control group. Those in the intervention group were treated with antibiotics for a minimum of 5 days, and the antibiotic treatment was stopped at this point if their body temperature was 37.8°C or less for 48 hours and they had no more than 1 CAP-associated sign of clinical instability. Duration of antibiotic treatment in the control group was determined by physicians. 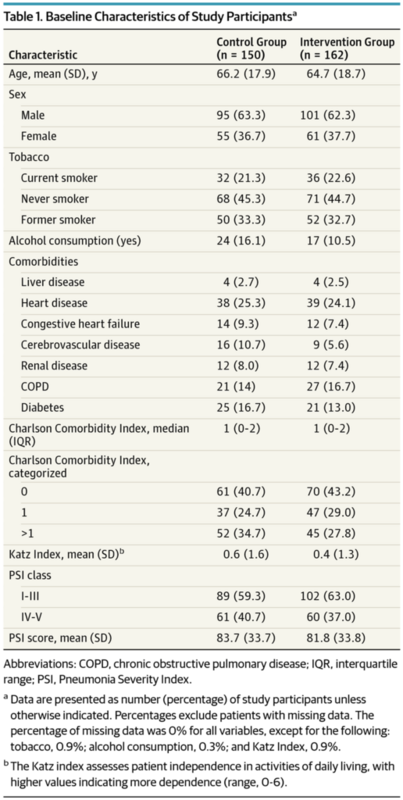 Clinical success rate at days 10 and 30 since admission and CAP-related symptoms at days 5 and 10 measured with the 18-item CAP symptom questionnaire score range, 0-90; higher scores indicate more severe symptoms. Of the 312 patients included, 150 and 162 were randomized to the control and intervention groups, respectively. The mean (SD) age of the patients was 66.2 (17.9) years and 64.7 (18.7) years in the control and intervention groups, respectively. There were 95 men (63.3%) and 55 women (36.7%) in the control group and 101 men (62.3%) and 61 women (37.7%) in the intervention group. In the intent-to-treat analysis, clinical success was 48.6% (71 of 150) in the control group and 56.3% (90 of 162) in the intervention group at day 10 (P = .18) and 88.6% (132 of 150) in the control group and 91.9% (147 of 162) in the intervention group at day 30 (P = .33). The mean (SD) CAP symptom questionnaire scores were 24.7 (11.4) vs 27.2 (12.5) at day 5 (P = .10) and 18.6 (9.0) vs 17.9 (7.6) at day 10 (P = .69). In the per-protocol analysis, clinical success was 50.4% (67 of 137) in the control group and 59.7% (86 of 146) in the intervention group at day 10 (P = .12) and 92.7% (126 of 137) in the control group and 94.4% (136 of 146) in the intervention group at day 30 (P = .54). The mean (SD) CAP symptom questionnaire scores were 24.3 (11.4) vs 26.6 (12.1) at day 5 (P = .16) and 18.1 (8.5) vs 17.6 (7.4) at day 10 (P = .81). The Infectious Diseases Society of America/American Thoracic Society recommendations for duration of antibiotic treatment based on clinical stability criteria can be safely implemented in hospitalized patients with CAP. Pneumonia ： pulmonary infiltrate on chest radiography not seen previously plus at least 1 symptom compatible with pneumonia, such as cough, fever, dyspnea, and/or chest pain. Disease severity ： Pneumonia Severity Index (PSI) calculated within the first 4 hours after diagnosis.